Royal Blunts makes hemp wraps in the HempARillo line and we have reviewed the Hemparillo Naked Hemp Wrap. 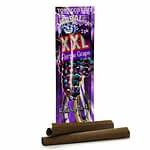 However, the Royal Blunts Herbal Wraps Purple Grape is a herbal wrap and is completely tobacco free! The packing for this is standard quality. The wraps come in a zip-loc pack that shows Grapes and XXL name. These herbal wraps come 2 in a pack, but the packaging claims you can roll “up to 4”, whatever that means. The packaging advertises that this product is tobacco free. As expected, this tastes a lot like grape. There is a hint of sweet, but the flavor is not chemical and doesn’t last long after smoke. This is probably one of the best herbal wraps we have ever tried and certainly ranks among the best on the market so far. The Purple Grape herbal wrap definitely smells like sweet grape, but it’s the grape that you smell with candy, not fruit. It’s very much like “Big League Chew” grape. We have found this to be typical with most grape flavors for wraps. The freshness of this herbal wrap is quite surprising. Out of the packaging, the wrap is easy to bend, fold, and roll. It smells fresh and looks fresh. The wrap is moist, but not wet and it does not leave a residue on your fingers. Honestly, it’s quite surprising how good these are. Absolutely no issues with the burn. It burned slow and fairly even. For a herbal wrap we are quite impressed. The flavor is not harsh at all. There isn’t much to compare this wrap to other than the Primal Herbal Wraps, but we think these are somewhat superior in a few ways. However, currently there is only one flavor so hopefully Royal Blunts will release more in the future. Overall, it’s not a bad value for an herbal, non-tobacco wrap. LOVE LOVE LOVE this wrap! It’s so timely and is a better choice than using tobacco products.